We are pleased to announce that an image of Ubuntu Core is officially available for uCRobotics’ Bubblegum-96 board. The board includes an optimised Actions‘ s900 Quad-core ARM 64-bit Cortex-A53 processor running at 1.8GHz and 600MHz PowerVR G6230 high-quality graphics with 2GB of DRAM and USB 3.0 support. This makes it one of the most powerful commercial edition Linaro 96Boards and the third Linaro board enabled on Ubuntu Core. Canonical along with Actions and uCRobotics have been working together and created the first beta image of Ubuntu Core for Bubblegum-96. This offers device manufacturers a great open platform for their application and Internet of Things (IoT) devices. The beta developer image is now available for download. 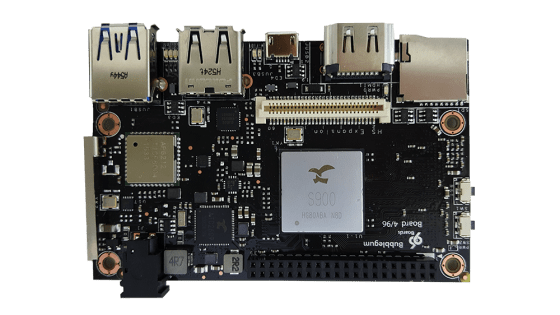 With support for Ubuntu Core, a stripped down version of Ubuntu designed for autonomous machines, devices and other internet-connected digital things, Bubblegum now offers device makers one of the most popular open platforms for IoT. Open source and secure by design, with transactional updates for fast, reliable updates, and small footprint, Ubuntu Core is also the ideal platform to deploy large fleet of IOT devices. Ubuntu Core also enables developers to publish apps that have been created for a whole host of different purposes and devices. For example, an app developed on Ubuntu Core and packaged as a snap is – a 3D Printer Cluster Management System developed for Bubblegum-96 boards called uC3DP (Your Cloud 3D Printing) – helped designers operate 20 individual 3D printers more efficiently. Without the need for human intervention, designers could send their work for printing. The app would in turn analyse the file and allocate it to a printer that was not in use. This allowed the designer to get on with focussing and creating new designs and not have to worry about how to operate a 3D printer, saving valuable time and money in the process. During the recent Computex Taipei, Bubblegum-96 board powered by Ubuntu Core was presented on Actions’ booth. A video from our live demo is now available online and can be viewed here. To find the ideal app for you, visit the Ubuntu app store. And to develop your own set of apps, or snaps, visit the newly created snapcraft.io webpage.